In a meeting with a senior U.S. diplomat last February, Ahmed Wali Karzai, who is the Kandahar provincial council chief, made the case that he, not the governor of Kandahar, was "the most powerful official in Kandahar and could deliver whatever is needed," according to a cable about the meeting leaked Sunday by WikiLeaks. His comments came just as the U.S. was about to focus its military efforts on Kandahar. WikiLeaks began publishing more than 250,000 diplomatic cables from U.S. embassies around the world Sunday in what it said was the largest-ever disclosure of confidential information. The cables will be released over the course of several months, giving the world "an unprecedented insight into the U.S. government's foreign activities," it said. During the February meeting, Karzai also brought up drug dealing accusations against him. "Unprompted, AWK (Ahmed Wali Karzai) raised allegations of his involvement in narcotics, telling the (U.S. official) that he is willing to take a polygraph anytime, anywhere to prove his innocence," the cable said. Karzai said the drug-dealing rap is part of a campaign to discredit him, "like a spice added to a dish to make it more enticing to eat." After a separate meeting with Karzai, a U.S. official who authored another cable wrote, "While we must deal with AWK as the head of the Provincial Council, he is widely understood to be corrupt and a narcotics trafficker. End Note." The cable concluded: "The meeting with AWK highlights one of our major challenges in Afghanistan. How to fight corruption and connect the people to their government, when the key government officials are themselves corrupt. Given AWK's reputation for shady dealings, his recommendations for large, costly infrastructure projects should be viewed with a healthy dose of skepticism." In the first cable, Karzai offers suggestions on how to stop drug dealing. "He suggested that the coalition pay mullahs to preach against heroin, which would reduce demand for poppy cultivation." 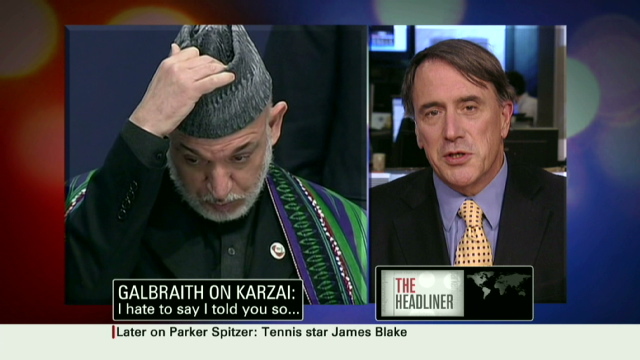 The author of the cable also wrote that Karzai "appears not to understand the level of our knowledge of his activities, and that the coalition views many of his activities as malign, particularly relating to his influence over the police." In addition to discussions of war, drugs and Afghan politics, a comment in one of the cables also addressed an American sports landmark. "Further emphasizing his links to the United States, AWK fondly recalled his days in Chicago as a restaurant owner close to Chicago's Wrigley Field. His restaurant was a hub for American[s] in the Midwest who had worked or lived in Afghanistan prior to the Soviet invasion," the cable read.